NIA – CHARLESTOWN, NEVIS (December 2ND, 2010) — Doved pork, fried fish in gravy, cornmeal, pork or butter bread and cocoa tea will make up the traditional Christmas breakfast that will be served this Saturday [Dec. 4] at the Gingerland Public Market. After months of rehabilitative work, members of the UNESCO Youth Path Project will officially open the market to the general public with a brief ceremony which is scheduled to commence at 9:00 A.M. The ceremony will be followed by musical entertainment and the sale of food and other items. The Department of Information spoke, this week, with Coordinator of the UNESCO Youth Path Project Ms. Vanessa Webbe and Board member Mr. Eric Evelyn who, in addition to being excited about Saturday’s opening, said they were even more excited about the projects that will take place at the market. “On the site for instance, there is an area where we will be conducting workshops. We will continue training in arts and crafts, continue training in areas like tour guiding and other areas of hospitality services that we think we can run from the site and this is what Youth Path has been doing over the past four years since it has been implemented in St. Kitts-Nevis. “In the long run we really want to have the roof over the stalls replaced altogether so we can give the public a brand new roof and so we’ll be working towards that in the coming year,” Ms. Webbe explained. 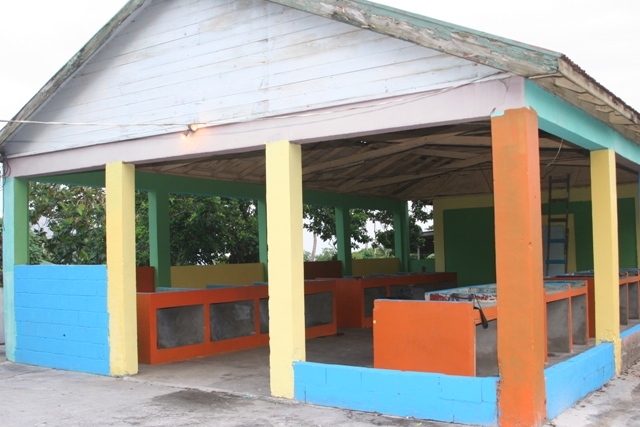 In addition to repainting the market with “very bright and welcoming colours,” the Youth Path members have transformed an abandoned office into a snackette that is expected to sell local foods and will be operated by local chef, Mr. Lenny Liburd. “The rehabilitation of the Gingerland Public Market project is not just a UNESCO Youth Path Project. It is a project that is for the community and so we open it up for other members of the community to be a part of it,” Ms. Webbe said. Meanwhile, Mr. Evelyn is appealing to Nevisians to capitalise on the opportunity to have a stall at the market, thereby expanding the island’s small business pool. “While there will be a small fee to occupy a stall, we will work with you. So we would definitely welcome anybody who would like to come this Saturday or any other Saturday or even during the week. If you want to operate there fulltime, we would surely welcome you,” he said. Mr. Evelyn, who resides in Gingerland, said that while he was pleased that the public market in his area will be reopened, he was more satisfied that the organisers of the event represented the youth population of the area. “It’s very heartening when we see young people could get involved in meaningful projects like these. The young persons from Youth Path have really worked extremely hard in getting the public market to where it is now and I really commend them very highly,” Mr. Evelyn said. “They are a very good group of young persons and we need to support young persons in these kinds of initiatives,” he added as he highlighted the reasons persons should attend the opening ceremony. Anyone interested in operating a stall at the Gingerland Public Market should contact Mr. Evelyn at 663-8941 or Ms. Webbe at 669-8455.